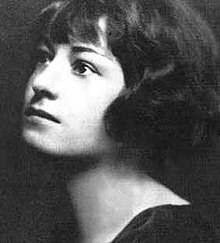 Dorothy Parker (August 22, 1893 – June 7, 1967) was an American poet, short story writer, critic and satirist. She was best known for her epigrams, wit, wisecracks, and her eye for 20th century fads and conceits. From an unhappy childhood, Parker rose to fame, both for her writing in The New Yorker and as a founding member of the Algonquin Round Table. After the breakup of the circle, Parker went to Hollywood to do screenwriting. She got two Academy Award nominations for this, but her involvement in left-wing politics put her on the Hollywood blacklist in the 1950s. She disliked her reputation as a "wisecracker". Nevertheless, her writing and reputation for her sharp wit have endured. A lady ... with all the poise of the Sphinx though but little of her mystery. The 'House Beautiful' is, for me, the play lousy. ↑ The Algonquin Round Table was a literary circle which used to lunch at the Algonquin Hotel in midtown Manhattan. This page was last changed on 31 May 2017, at 08:28.